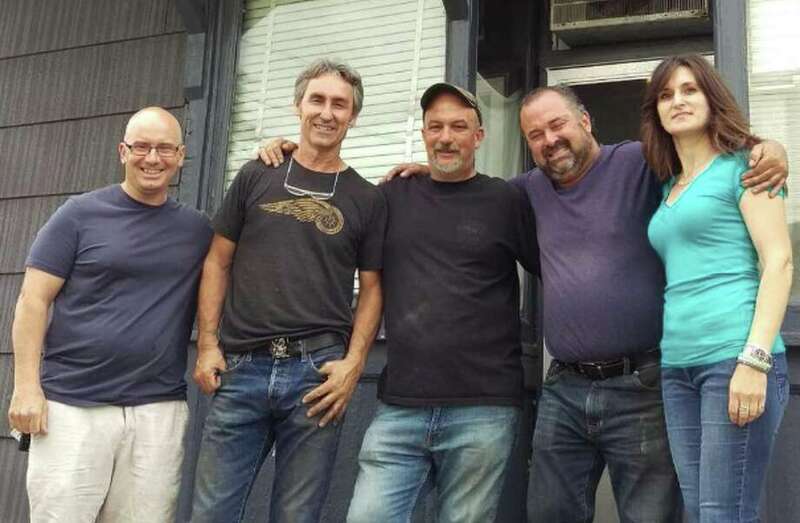 Michael Catalano, Mike Wolfe, Matt Catalano, Frank Fritz and Marie Catalano stand in front of a former Italian grocery store on Hawkins Street in Derby where an episode of “American Pickers” was filmed in June. The show is scheduled to air Monday, Feb. 4 at 9 p.m. on the History Channel. DERBY — More than a century of Italian family history will be on display Monday night during an episode of “American Pickers” filmed last summer in a former downtown market. The show follows “pickers” Mike Wolfe and Frank Fritz as they scour properties across the country to find valuable antiques in places like junkyards, garages, barns and basements — then haggle with the owners over a fair purchase price. Stratford resident Matt Catalano said the pair struck paydirt in their hunt at a former Italian grocery store once run by his great-great uncle, Antonio Voccia, in a converted barn on Derby’s Hawkins Street dating back to the late 1800s. The neighborhood was once a vibrant Italian enclave in downtown Derby, with some vestiges still intact, like Altimari’s Little Italy nearby on Elizabeth Street. Catalano said someone forwarded him an ad the show put in the Connecticut Post saying they would be filming in the area. He replied with a note saying he was a fan and that the former store still contained a treasure trove of potential finds. The store closed in 1954, but Catalano’s great aunts lived in a space above the former store until last year, when his last surviving aunt died. The pickers showed up one day in late June — and filmed for 16 hours, Catalano said. “We had a great time. They were great guys, the crew was great and we had a lot of fun,” he said. Derby Mayor Rich Dziekan said he stopped by the shoot to introduce himself and thank the pickers for showcasing a part of the city’s history. The city helped the production crew with logistics, he said. Catalano said the filming process was pretty straightforward. The episode, titled “A Picker’s Dozen,” is scheduled to air at 9 p.m. on the History Channel.